Tatterdemalion Grove is a world to wander in day and night, a wasteland garden of kinetic sculptures and animated detritus, for green or empty spaces, festival sites, abandoned car parks and urban wastelands. 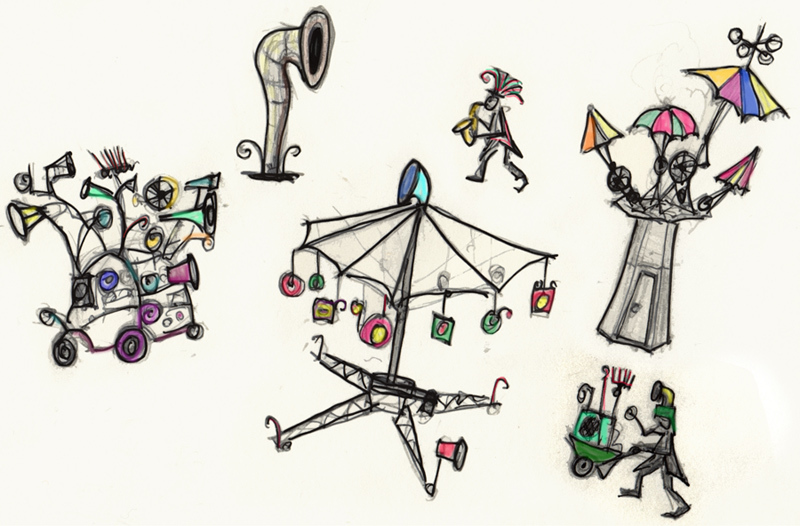 The installation features the Umbrella Tree, an absurd mechanical contraption of motor driven umbrellas and the Hurly Burly, a mobile sound sculpture, sonic amusement and junkyard delirium. Inside the grove we will be a menagerie of small synthesizer and sound making devices; a collaboration with Farmer Glitch, creator of bespoke hand held electronic instruments. These will be hanging from carousels & structures and with both portable & static speakers we will create an ever changing live soundtrack & audio playground. The Grove will involve workshop and interactive elements, for example culminating in a noisy Wassail and communal performance every evening. Contact us for more details, pricing & tech specs.